Finally, someone thought of making a Potty – Training Toilet that resembles an adult toilet. No more hustles when it comes to training your child on how to use the toilets when he grows up. The Summer Infant My Size Potty is a good self-train potty every mom should have at home. The potty is so much adorable, and can impress any child. The potty’s realistic design is very impressive and gives a child that feel of a real toilet. This means, it is not scary as the normal potty; instead, it gives that appealing feel to the child, a fact that increases his or her urge of using it. Its handle is designed perfectly to feature a flush sound, which rewards your child for a job well done after attending to that natural call. The good thing with this flushing feature is that it teaches your child that good habit, which some people don’t have, of flushing the toilet just from day one. This reality makes a child understand his duty immediately. 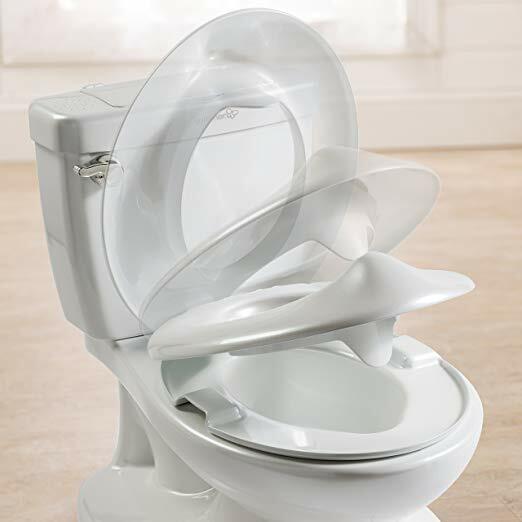 Amazing, this potty was designed to include an area that could store wipers. Even though some people complain about its wipe holder being small, at least we should appreciate that the wiper storage area is available. Besides, since the lid usually comes off entirely, you can as well make the water tank as your wiper storage; fortunately, this can even fit those full size wipers. This will make the second storage area on the product, and so you will be able to maintain the potty’s cleanliness as much as you can. To add on this, the product has a flip-up lid, which is also removable and so, it gives you a humble time when it comes to cleaning it. If you are a mom who likes maintaining cleanliness, this is the right potty for you; since you won’t go through the annoying experience of trying to clean a potty which is not cleanable in the first place. At times, boys can be hard to train when it comes to using a potty, however, the flip-up lid and clip-on splash, eases your entire training process. With minimal time, your boy will have mastered the art of using this potty. Luckily, the inbuilt wipe dispenser helps you in maintaining higher standards of hygiene, so you won’t get worried on how to train your boy, and at the same time maintain hygiene as far as possible. The product is turgid, just to maintain your eighteen months child up to fifty pounds. That means the product is very much durable, and that it can easily maintain your child for a considerable time. My main concern is that the potty slides easily on the floor. Even though to some parents this might be an advantage, to me, I think little rubber pads could have ensured more stability, especial to a child who is hyperactive. Otherwise, its color and everything else is perfect as well as its true association to the adult toilets. Children are at times good mimickers and so, giving them products that look like what adults usually use, will mean good habits learned at earlier stages of life.